You require cooking oil in everything you cook, from salad to main course. They come with advantages and disadvantages of their own. Some cooking oil is fully vegan while some are obtained from animals. The right ones act as shield against heart diseases, cholesterol blockages, obesity and digestion problems. Again the quantity of oil required depends on the cooking method used to prepare a dish. Moreover, different oil behaves differently when heated. Some changes texture, color, taste and some the nutritional properties of the food. Again some contain polyunsaturated, some monounsaturated and some saturated fats. 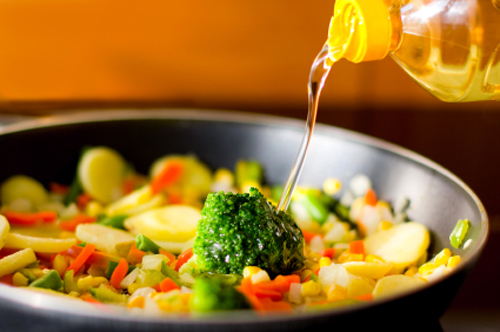 Here is a list of the top 15 best healthy cooking oils available in the Indian market. Olive oil is one of the healthiest cooking oil available in India. It is obtained by crushing olives and is available in different varieties as per the processing involved in manufacture. It has the ability to cure diabetes, heart disease, protection against chronic degenerative disease, human metabolism, good level of vitamin E, anti-inflammatory benefits and colon cancer. Rice bran oil is popular cooking oil in India. It is an active mixture of 47% monounsaturated fat, 33% polyunsaturated and 20% saturated fats. The oil is chemically extracted and is refined, bleached, deodorized and dewaxed as per its application. It contains no cholesterol and trans fatty acids. However, it is rich in oleic and linoleic fatty acids. Sunflower oil is also used by many households in India. This oil too is chemically extracted and refined, bleached, deodorized and winterized before packaging. It is a store house of vitamin E and it highly valued for its excellent health benefits. The oil comes in three types viz. linoleic, mid-oleic and high-oleic plus it is also a combination of monounsaturated and polyunsaturated fats. Groundnut oil also known as peanut oil is a perfect combination of monounsaturated and polyunsaturated fats. This all-purpose cooking oil is abundantly available in India. The omega 3 fatty acid content fights cancers, generative nerve disease, Alzheimer’s disease, and viral/fungal infections. It also lowers the risk of heart diseases. Mustard oil is one of the commonly used cooking oil in India. The oil has the ability to improve digestion and fights germs and virus in the body. It develops a good appetite and helps prevent cold, coughs and skin related problems. The high smoking point makes it ideal for deep frying. Sesame oil is most popular oil used in the Indian household. The oil has the ability to fights depression, atherosclerosis, cancer and improve oral and dental health. The flavor is mild and has a very high smoking point making it ideal for deep frying. Active ingredients include magnesium, copper, calcium, iron and vitamin B6. Edible almond oil helps fight cancer and other heart diseases. This healthy cooking oil protect against heart diseases and cancer but maintaining the cholesterol level in food. It cures irritable bowel syndrome and help you develop a good appetite. It is abundantly available in India. Coconut oil is a storehouse of saturated fat and behaves perfectly ideal in high temperatures. Best cooking oil suitable to fight bacteria, build immunity and increase metabolism in the body. However, it does raise the blood cholesterol and LDL cholesterol level. Soyabean oil is rich in poly and monounsaturated fats. The omega 3 fatty acids content reduces the risk of cancer, generative nerve disease, Alzheimer’s disease and viral/fungal infections. This active cooking oil also keeps a check on the risk of heart diseases. Canola oil is considered as the healthiest of all cooking oil. It is derived from the crushed seeds of canola plant and has the lowest saturated fat content. This oil good for the skin is rich in monounsaturated fats and omega 3 fatty acids that help fight blood pressure, inflammation, Alzheimer’s disease, viral/fungal infections and reduce the level of cholesterol. This oil rich in monounsaturated fats is mildly nutty and is considered quite healthy for the Indian climate. It is mainly used in dressing, in mayonnaise, vinaigrettes and in grilled fish. It is rich in Vitamin E and hence works as a very good source of the same. If not store well, it can be spoiled easily. Palm oil is healthy oil used in the Indian household. The oil is rich in antioxidants, carotenes and Vitamin E and helps to fight diseases such as cancer, Alzheimer’s, arthritis, atherosclerosis and anti-aging. This active cooking oil also keeps a check on the risk of heart diseases. Flaxseed oil is also used by many households in India especially the vegetarians. It is a rich source of omega 3 fatty acids that helps in reducing the risk of cancer, generative nerve disease, Alzheimer’s disease and viral/fungal infections. It also heals Crohn’s Disease and colitis. Grapeseed oil is prepared from the leftovers of wine making. This healthy cooking oil is very low in saturated fat and comes with a mild taste. Though not widely used it is considered a great cooking and frying oil. Cashew oil is not widely used in India. It is a great snack and is used in sweets and baking. The anti-bacterial properties of this oil improves eye health, reduce inflammation and cholesterol in the body. The oil also keeps a check on the risk of heart diseases and other health related issue. Keeping edible oil aside for a while, here is the list of best hair growth oil in India.